Sometimes there are options to replace missing teeth. Sometimes the best choice is an implant. For a successful implant, a patient must have proper bone density and a strong immune system. The best way to describe a dental implant is to compare it to a real tooth. A natural tooth consists of a root and a crown. Beneath the crown is the root, which anchors the tooth through the gum tissue into the jawbone. When you loose a tooth, you loose both the crown and the root. To replace the tooth we must first replace the root. 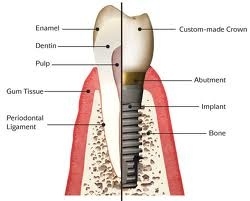 The implant is a new root made from titanium, chosen for it's strength and acceptance by the body. The implant is inserted and allowed it to heal for 3-6 months. Then Dr. Giebenhain will design a custom crown to replace the crown portion of your tooth. Another option to replace a missing tooth is a permanent bridge. If there are teeth on either side of your missing tooth that have good bone support they can be used as anchor teeth. This procedure involves 2 or 3 appointments where the anchor teeth are prepared and impressions taken. These impressions are sent to a lab and a custom bridge is made just for you. In approximately 2 weeks your bridge is ready to be permanently cemented into your mouth. Dr. Giebenhain and his staff will be glad to help you decide which of these treatments are right for your needs. We believe the best decisions are made with good information and assistance.